KEYSTONE — Golf is in full swing at Keystone Resort, as the Ranch Course opens with 18 holes ready to play on Friday. 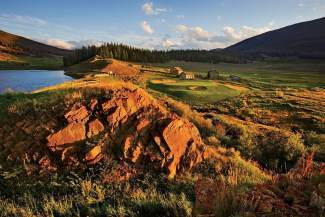 Already open at Keystone is the River Course, which offers 18 holes of mountain-style play. Golf enthusiasts can enjoy a full summer of fun on the greens with a variety of Keystone season-pass products, providing access to all 36 holes of championship play. The Robert Trent Jones Jr.-designed Ranch Course follows the links style of a Scottish course on the front nine, while the back nine presents a traditional mountain valley layout. Winding through lodgepole pines, around sage meadows and across a nine-acre lake, this par-72 course features slight elevation changes and many bunkers for a scenic, challenging round of play. Throughout the summer Keystone’s courses will offer a variety of lessons and clinics specifically geared toward improving golfers’ games in a productive and friendly atmosphere. Half-hour private lessons with a PGA professional that are tailored to individual skill level and goals are available for $50. Clinics such as Boomers on the Links at the River Course for seniors and Just for Juniors for 17-and-under golfers also will be available throughout the season. On August 21, Keystone Resort will host a clinic with Nancy Lopez, winner of the Rookie of the Year and Player of the Year awards in 1978. The clinic will include breakfast, putting exhibition with Lopez, short-game clinic stations focused on putting, chipping, pitching and sand, followed by a boxed lunch. Golfers will have the chance to round out the day with nine holes on the Ranch Course with Lopez hitting a par three with each group.